The weather at Kelling Heath during March, April and May was once again relatively mild giving us a fairly early start to spring for what in my records is now the 3rd year in a row although it did turn cold again by late march. This is always a period of instability in the weather, said by Meteorologists to be due to the air warming up and the ground still being cold. But this is exactly what nature needs to stimulate vegetation into action. A late cold spell can of course play havoc with a wide range of plants and animals especially blooming wild flowers and early insects but the strengthening Sun begins to break winters grip on our countryside and at the end of March the blackthorn – one of the first trees to flower -comes into bloom. It’s great to walk around Kelling any time of year but for me there is always something extra special about spring. I love the spring. Walking the path that follows the North Norfolk railway line in March we had an abundance of Lesser Celandine. This small yellow flower in common with other spring flowers such as the snowdrop or daffodil has an underground source of food in the form of a bulb that enables them to use this stored resource to compensate for the lack of daylight hours. The Bluebells put on their usual show along here too but I don’t think this has been one of their better years. Last year was one of the best I’ve seen. The sensitivity of bluebells to the right conditions make them an excellent indicator of ancient woodland (woods that have existed continuously without clearing and replanting since 1600) and some of the bluebell populations you will see in the UK are hundreds of years old. Mature bluebells usually start to grow as winter fades but the growth depends on weather conditions. After a severe or extended cold spell flowering can be delayed by several weeks. Usually shoots can be seen emerging from the soil in February and by late April the sweetly scented flowers start to open and the flowers are the centre of attention for butterflies, bumble bees and other insects interested in the rich bluebell nectar. Primrose on the other hand did very well especially along the railway track. Here we found the bee-fly which is easily mistaken for a bumble bee. It looks like a bee with a long snout but is in fact a true fly, searching for nectar among the blooms of primrose, lesser celandine or the wood anemones. On the subject of the Wood Anemones, did you know that they don’t have to rely solely on Bees pollinating them ? The seeds have a small parcel of a yellow fatty tissue - called an elaiosome - attached to them. The helpful Ants take the seeds back to their nest so they can feed the fat to their larvae, and so the seed is transported to a new location (or sometimes dropped in a new location.). If you’ve read my previous blog you will note that this process happens with Gorse seed too. When spring is in the air many animals are coming out of hibernation and that includes some of our butterflies. In April, on the days that the thermometer went above the ten centigrade mark we spotted the ‘usual three’ Peacock, comma, and brimstone over the heath having over wintered in hibernation. Yes the butterflies hibernate too and, by staying dormant and using little or no energy they are awakened by changes in temperature to feed on the early pollen. Interesting to note that it is not only the bees or butterflies that work as nature’s pollinators but the flies do a pretty good job too. If you walk up to the conservation pond in late April / Early May there is a place where Honeysuckle and the Rowan or Mountain Ash grows side by side. The Honeysuckle gives off a lovely heady scent while the Rowan smells as if something has gone off! The Honeysuckle is visited by Bees and the Rowan is pollinated by flies and in particular the Hoverflies. 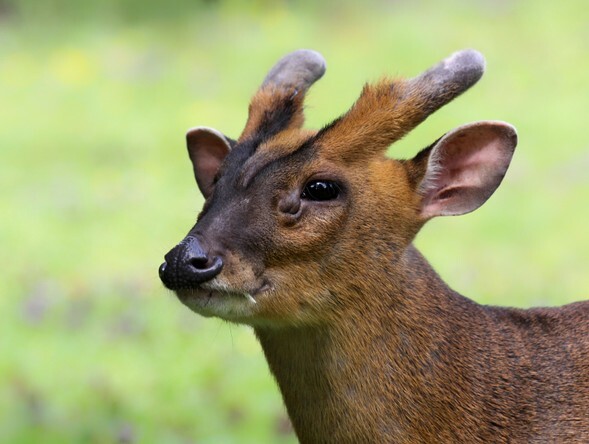 On the Mammal front we have seen and heard Muntjac – which you may have heard on the park as it barks rather like a Dog with a sore throat and on a couple of walks we got to see young rabbits, possibly above ground for the first time in the woodland fire brakes and roadside verges. The first Bats were seen on the wing mid April with Common and Soprano Pippestrelle bats around the woods and some good fly pasts of Brown long eared bats around the fishing pond. Incidentally, a couple of interesting news items to tell you, early spring the conservation team at Kelling installed a nice new bug hotel by the bottom pond, see here for details, and the conservation pond has become home to a shoal of Crucian Carp, a fish that in Norfolk has declined by 75% since the 1970’s, where they will be monitored by the Conservation team and University College London. Exciting stuff! Plenty of birds around the woods and on the heath this spring, with an abundance of Chiffchaffs singing in the wood by the railway line. (you can’t mistake the Chiff Chaff of their song) A Wheatear was spotted on an early May walk by one of our visitors fresh in from Africa. Quite a good spot as they are often unseen until they are hopping away from you showing a white rump. They stay but a short while to feed on their way from Africa to their upland breeding haunts. The Nightjars arrived early May and have been showing really well. On the walk first May bank holiday weekend a group of us had 6 separate Males in song. So, Spring got off to an early start this year at Kelling Heath, pushed along by some very unseasonably good weather. We have had some amazing wildlife already and it’s still early in the season. Kelling has so much wildlife to offer and I hope to see you on a family nature ramble or Wildlife at Dusk walk this coming summer. Look out for my guided walks on the events sheet in reception. Can’t wait to see what the summer brings! Have a great summer!